Only a few years ago, while I was waiting for my bus, did I see Jayalalithaa in person for the very first time. Sure, it is quite unavoidable for anyone in the state to not feel stalked by the leader, by her innumerable posters, unintentionally skewed portrait sketches painted across walls and her face beaming from television sets, but this was different. I only saw her for a fleeting few seconds, just her face in fact, bright even from inside the tinted window of her bulletproof SUV, but I saw her nonetheless. Back then, I was not a journalist yet and so had no access to leaders or stars and so I was very awed by the incident. Later that day, I’d narrate the episode to everyone I met. The whole charade lasted only for a few seconds, my eyes keeping up with the pace of her car, but in retrospect, I believe it was the build-up to her entry, orchestrated with a flourish, is what amped up the spectacle. Of how traffic was diverted or stopped for those few minutes. Of how traffic cops were stationed every few metres to ensure a safe passage. Of how life was forced to a standstill on that stretch near the beach, on that steamy hot afternoon, even if for a few minutes. This, I assumed, to be a memory from the artist himself, a personal admission of sorts, and while I recalled my own, I also made a mental note to prod him further on this. Elaborating further, he says his work is built on collective experience, a hazy assortment of visuals we’ve seen and ingested all our lives, the boundary of what is yours and what isn’t becoming fuzzy. “Any viewer of cinema or television in Tamil Nadu, any follower of politics would have had this experience. In a way, it becomes everyone’s memory. ‘My’ memory is tampered by the ‘collective’ memory. Fact becomes fiction and it becomes difficult to distinguish. It was this feeling that the politicians were trying to play with. I have used the very same language in my work,” he says. ‘I swear on my mother’ is close to 10 minutes long and is an interesting compilation of videos, texts and photos arranged to create a canny interpretation of politics in the state, presented in two screens placed next to each other. Its timing could not have been more apt, given that the state awaits its first big election since the passing of two giants – Karunanidhi and Jayalalithaa. Karthik’s work was displayed at the second edition of the Chennai Photo Biennale last month. Karthik’s familiarity with Madurai, his ancestral hometown, helped him greatly when he began researching about cinema and politics in 2013. With Madurai being the epicentre of politics in the state, it gave him ample access to the state’s political culture and therefore when he was selected by an Italian agency, FABRICA, to document the 2014 general elections, Karthik was able to refine his project. The work itself is quite extensive, covering not just Jayalalithaa but also her mentor MGR. “It is a small part of a larger work I’m doing. There’s another part that will focus on MGR. I also intend to focus on the current crop of aspiring politicians in the state. 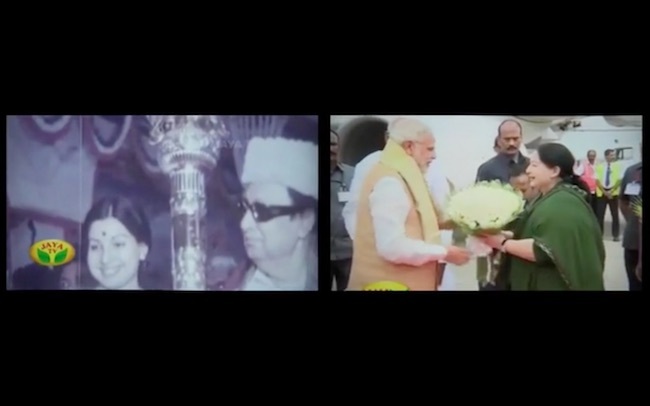 It is only because of these two – MGR and Jaya – that people from cinema are even thinking about entering politics. In that sense, MGR and Jayalalithaa are important forerunners. The baggage of MGR has made it possible for people like Rajini, Kamal, Vishal, et. al. to consider public life,” Karthik suggests. Even a non-local can appreciate Karthik’s commentary on the cult worship these leaders enjoy in the state. There aren’t any subtexts for us to decode and Karthik says he used a language that is quite common in today’s social media era. “Everyone is making videos and spreading their own agenda on social media today. There is no telling what is true and what is manufactured. This is my own edit and I’ve presented it in the same space, hoping it becomes part of a larger language. It is completely influenced by cinema,” he says. What Karthik hopes, however, is that people will contemplate on and question the present state of affairs in politics. “We really have to question how this manipulation works. Even in a democracy, many a time the rulers try to take control over the minds of the masses. I want to question the extent to which we allow a ‘leader’ to manipulate us. This isn’t restricted to MGR or Jayalalithaa in particular. This is a global pattern. All dictators have played the same game. It dates back to the times of kings and this pattern has been repeated. This needs to change,” he explains. The video itself is a clever edit of television footage, all of it from Jaya TV, but it cannot be called just a caricature of the late leader. There are songs from her old movies played over television news recordings from recent times, early black and white footage of a younger, happier looking Jayalalithaa walking alongside MGR, and clips from both MGR and Jayalalithaa’s funerals. Prime Minister Narendra Modi too makes an appearance in two places: “Those are very critical moments. In one, Jayalalithaa greets him with flowers. Up until then you would’ve seen Jayalalithaa receiving flowers. The other is during Jayalalithaa’s funeral. We know he is performing for the camera. His presence in TN also is something we have to think about,” Karthik tells us. 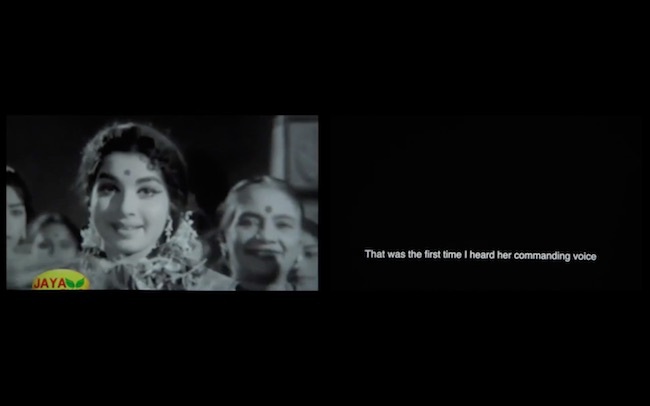 Karthik’s choice of medium – the television – in ‘I swear on my mother’ is indicative of the larger idea his work harps on. “MGR used cinema as his propaganda tool, Jayalalithaa and Karunanidhi were the first to use television for this very same purpose. Television is a personal medium, at home you’re feeding your child and at the same time watching their (leaders) sermons on screen. It gets even more scary when personal space is used to take control over the minds of the masses,” he says. But the choice of title – I swear on my mother – an English translation of one of MGR’s most famous songs ‘Thaai mel aanai’, is indicative of the irony, the rift between what is shown/heard and what it actually means.